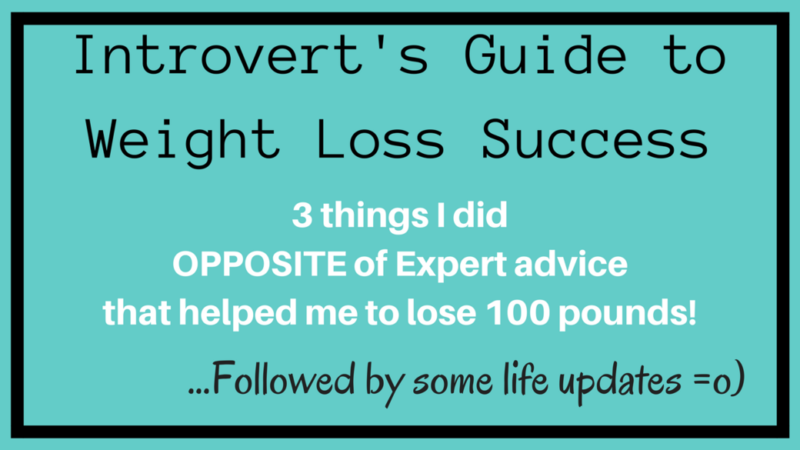 Welcome to my Introvert’s Guide To Weight Loss Success! This is a post that I began writing back in JANUARY and am just NOW getting it completed and posted (aaagh!). The written portion was what I originally wrote (in Jan) and the Video portion I did this week (deep in MARCH). I like to do both because for me it’s fun, and for you, some of you like video while others prefer to read! My video contains much of the same message only with greater detail and it includes a life update and announcement at the end. I recently heard the statistic that by the end of January only about 8% of those who made New Year’s resolutions are still sticking to them. ONLY 8%! Since weight loss is the number one resolution made, I thought I would weigh in and share with you some of the tips to my success at losing 100lbs and how I’ve been able to maintain that for 5 plus years since I completed my weight loss. The experience I’m about to share runs somewhat counter to the advice I have heard from most weight loss experts in my past 20 years of watching talk shows (because that’s where I hear and see most weight loss advice being given). I have a theory, that most weight loss advice is given by Extroverted personality types and is geared towards other Extroverts. But what about the Introverts? 1) Set a weight loss goal. Give yourself a number to aim towards. If you have the goal set you will be able to create a plan for how to get there. This goal could be your target weight, the number of pounds you want to lose or your goal dress size. 2) Share this goal publicly as it will help you with accountability. 3) Get out and JOIN something. This not only gives you more people to whom you have accountability with, but often the act of paying for something aids in keeping you dedicated and invested. All of this sounds completely reasonable and I’m pretty certain there are studies to back up the validity of these claims. But these are the exact things which kept me from ever trying to lose weight in the first place! 1) I did NOT set a weight loss goal!!! Setting a specific weight loss goal (at least for me) is a sure fire set-up for failure because psychologically it puts me into a position where each day that I’m not at the goal or seeing the scale move in that direction, I am somehow failing. It makes me feel like there is a time limit or a race to get to a specific destination. Not being at my destination gives me anxiety, makes me feel guilt and all around miserable. I would give up because the destination is so far away that I will never reach it. Breaking the big goal up into smaller increments (such as only focusing on 10 lbs at a time) doesn’t make a difference for me because I am still aware of the bigger picture. More importantly, setting a specific end result weight loss goal takes the control of reaching that goal out of my hands because I don’t have control over what my body can metabolically achieve. So, instead of setting a weight loss goal, I set a goal that would put me into a position of WINNING and ACHIEVING every day because I set a goal that gave me instant gratification and full control over the results. I SET A GOAL OF ACTION! I knew that there were 2 things that I could do to get myself out of the size 20 jeans I was in. These 2 simple acts would change my entire life. The goal: I needed to MOVE MY BODY more than being sedentary each day, and I needed to cut all the food on my plate in half (portion sizing at its simplest). All I had to do were these two things every day with consistency and I was WINNING and achieving my goals on a daily basis. It felt amazing! There was NO DESTINATION. The weight loss was a pleasant side effect. 2) I kept my goal personal. I did not publicly share what I was doing. I didn’t really talk about it with people outside of my family until people started noticing my shrinking size and asked me about it. WHY? Because when I talk about things, my brain feels released, and it thinks it has already done the plan. The action fizzles out. This was about ME, and me alone. I was the one who made myself a size 20 therefore I needed to be the one to heal myself. I did not need to involve others and I did not need or want anybody else’s approval or accountability. This wasn’t about them. I needed to take this journey solo. 3) I didn’t join anything. I didn’t spend a dime. There were no gimmicks. I imagine many other people have this same reaction. It’s a shame that I hear so often from the experts that this JOINING thing is an imperative key to weight loss success! I’m sure it can be for the many extroverts out there, but what about the introverted populace? Kinda leaves our possibility of success high and dry when you feed us those statistics! What worked for me? Finding a way that was unique to my soul. Finding a way to eliminate as many excuses to not work out as I could find. Thinking outside the box. Figuring out something that would fit into my normal life and meal planning. My Workout: 20min, 4-5 days a week, RUNNING IN PLACE and dancing in my kitchen while watching my favorite shows and daydreaming that I was training for the Olympics. I also made sure that I was moving my body throughout the day at times when I would otherwise be standing or sitting still. I eventually added a core routine and that preformed miracles for my waistline. But that was it. My Meal Plan: I can eat ANYTHING I want, just not EVERYTHING I want! I would go about fixing my usual meals then I would cut everything in half, eating one half and putting the other half away. For snacks I made choices… I read labels and used that information to sway my decisions. I can choose to eat a doughnut but I know it will have zero nutritional value for those 350+ calories contemplate if it was worth it. Sometimes it was very worth it! Usually it was not and I would put the doughnut aside and select a fruit. 4) Consistency – Consistency – Consistency! I’m adding in this #4. I’m pretty sure it is in compliance with Expert Advice as being a pillar to weight loss success and it will apply if you are Extroverted or Introverted. I was CONSISTENT. Day in, day out, I was consistent. SO IMPORTANT! Hope these tips can be of help to you!